Increase the drilling depth of your auger with Digga's range of heavy duty auger extensions. For drive units with 100mm square shafts, XO40 outer and XT40 telescopic (inner) extensions are available in 3 different lengths - 6ft, 8ft, and 10ft. Heavy duty welded hubs and shafts provides extensions with more rigidity and reduce excess play in the connections resulting a straighter hole. 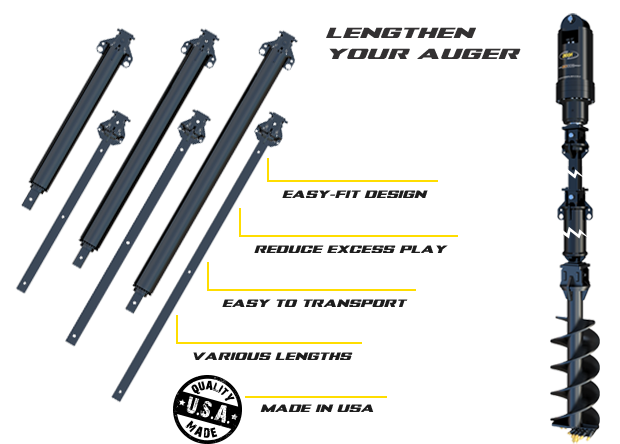 Various length options available for heavy duty auger extensions including 6ft, 8ft, and 10ft for XO40 outer and XT40 telescopic inner extensions.